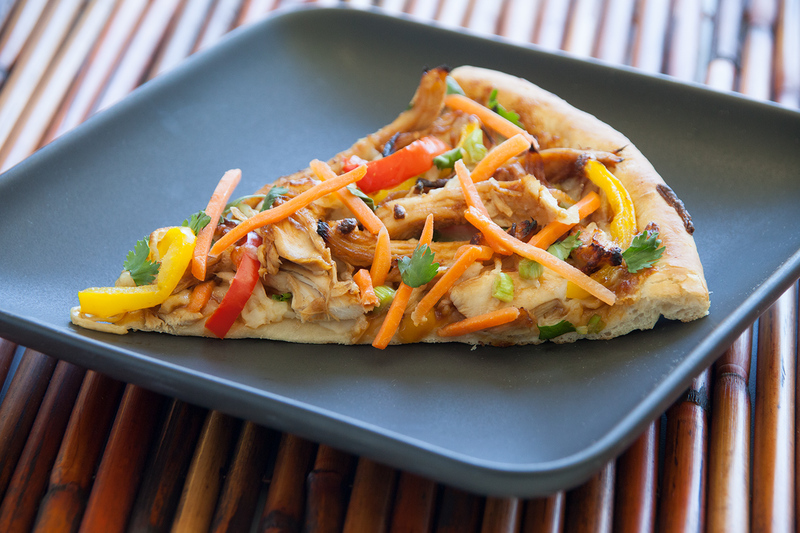 This wonderful pizza is topped with lots of crunchy vegetables and has great Asian flavors. Spray counter lightly with non-stick cooking spray. Combine rolls into a ball and roll into a 13-inch circle. Cover with plastic wrap and let rest 15 minutes. Remove wrap and place dough on a sprayed 12-inch pizza pan. Spread dough evenly with 2 tablespoons hoisin sauce. Combine chicken with remaining hoisin sauce and stir until evenly coated. Sprinkle crust with 2/3 cup cheese. Top with chicken, green onions, red and yellow peppers and remaining cheese. Bake at 425 degrees F 8-12 minutes. Remove from oven and top with carrots and cilantro.